After the surgery people were concerned and interested in what had happened. They couldn’t imagine that someone my age and someone that they knew personally could be diagnosed with cancer. The weather in Baltimore is starting to warm up and summer is just around the corner. But before you run off to the beach, please take a moment to treat your skin right. 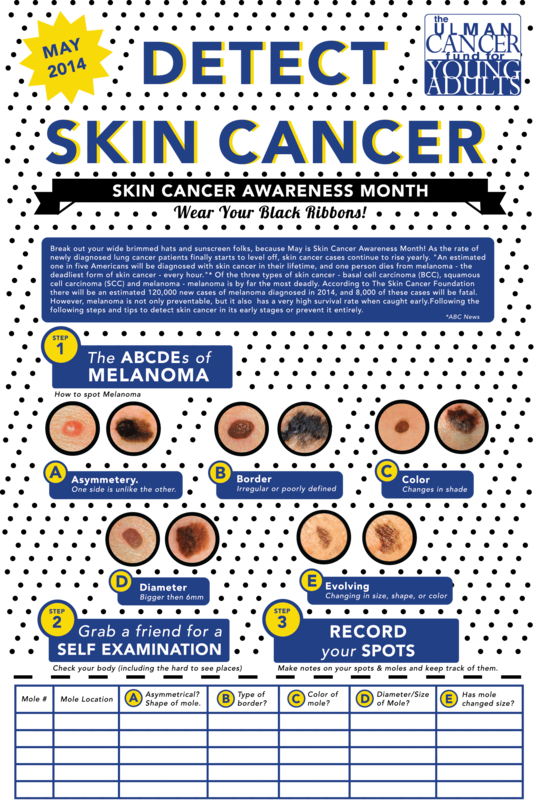 Skin cancer, particularly melanoma, is the most common cancer diagnosed for young adults. Ways to help prevent skin cancer is to wear sunscreen, long sleeved shirts and pants, and limiting exposure to the sun – especially during 10am to 2pm. To help find any suspicious looking spots on your body we created a chart covering the ABCDEs of melanoma. You can print out the chart and fill out the bottom to help keep track of each mole on your body. It is wise to do a full body exam once a year to notice if any new spots appear, or old spots change. “Senior year of high school is associated with many things: parties, varsity sports, friends, prom, graduation, college acceptances, goodbyes to old friends, and cancer? Many do not place “cancer” in this group of events, and neither dad I. I never thought that cancer would happen to me. Actually I never thought about the possibility of cancer at all. How could I? It was March 2005, my senior year of high school, and the first day of lacrosse tryouts. My lacrosse team was the best; number one in the nation in all four of my years at Mt. Hebron High School. I had never lost a game, it was my senior year, I was a captain, I had the best of friends, and I was off to the University of Pennsylvania in the fall. Lacrosse hand become my life – nothing else seemed important. Nothing could change my perfect my dermatologist on a Thursday night, March 5th. He told me that I had skin cancer, melanoma, on a mole on my left shoulder blade. I have had routine mole checks since I was in third grade, and have had seven moles removed in my lifetime. I never suspected that these routine checks would turn into something that would drastically alter my life. This call would not only change my life immediately, but it would have a continuous impact on my life, especially since I was only 17. Luckily it was stage one melanoma and it was removed during a three hour surgery. No hospital visits required, no general anesthesia, and no having to mess with my lymph nodes. I simply had to get through the surgery, allow the wound to heal for a few weeks, and wait for my life to return to normal. After the surgery people were concerned and interested in what had happened. They couldn’t imagine that someone my age and someone that they knew personally could be diagnosed with cancer. I assured them that it was just a mole, easily removed by a three-hour surgery. I felt like I had a “fake excuse” for what cancer diagnoses are usually associated with – hospital stays, chemotherapy, radiation, continuous tests, and constant sickness. My experience was simple. The cancer was removed in a couple of hours, and the scar on my back was the only remnant of my “battle” with cancer. Or so I thought. My procedure was quick and I recovered in about four weeks. However, the emotional impact of what has happened to me will last a lifetime. As my wound physically healed, my friends and most of those who knew me began to move on from this “unusual” experience. I tried to move on as well, but soon realized that the emotional recovery would become something unlike anything I have ever experienced. At first I would shake it off when people asked about the cancer, or laugh it off as if it did not faze me. I even commented that it was just a big scar that would make for a pretty tattoo on my back one day. Everyone always joked I was the girl slathered with sunscreen sitting under the umbrella at the beach. Somehow I felt like since everyone else had moved on from my experience and had acknowledged it as a big scar, I needed to do the same. Who was I to pull an “I had a cancer story,” when the process of removing the cancer occurred in a span of three month, years, and even a lifetime, and thinking of these individuals made me feel slightly guilty. I felt like I was being selfish for grouping myself with people who had suffered throughout their entire lives, people who had their worlds consumed by their diagnosis, and who had to be continuously strong. It has taken me almost two years to figure out what has happened to me. The emotional recovery is an ongoing process in my life, unlike my speedy physical recovery. I am still trying to discover why this happened to me and how I can use my experience with cancer to help others. I am not a cancer survivor with a medical or spiritual miracle story to tell, nor did I physically battle for years with my diagnosis. However, I still had cancer. I still want to be associated with all the brave individuals who have cancer and those who are continually coping on a day-to-day basis. Every three to six months I have to go to the dermatologist. Each time I visit the doctor I wonder if shoe will find a mole that will need to be removed. If they find a mole, will it be cancerous? Will it change my life again? Hopefully I will be lucky enough that if cancer is ever detected, it will be caught early enough so as not to become more serious than stage one melanoma. I think I realized how serious my diagnosis could have gotten and how lucky I was, when a local reporter interviewed me right after my surgery. He asked me, “So how does it feel knowing that you could have died.” I laughed at this question and replied “That could never have happened to me-this cancer was not like that.” That question didn’t impact me until two years later, and at the age of 20; I finally began to understand that could have died from my melanoma if it had gone undetected. I was one of that lucky ones. This May (and every month this summer) please take extra care to avoid burns and over exposure to the sun. Use the below chart to help monitor your body. If any spots or moles start showing warning signs, please inform your dermatologist. Cancer Changes Lives…So Do We!